Did you know we offer spa services at our East location? Call (316) 681-0077 to book your next facial, waxing, or massage. Our goal is your satisfaction. Our staff is recognized worldwide for their technical expertise, communication, variety, imagination, and knowledge. A good haircut should make you feel great. It is one of the most important accessories you own. It is an accessory you wear every day, all day. Your haircut should be easy to care for and contemporary in style. That is what we strive for. 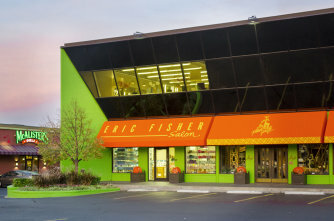 Renowned as one of America's best, the Eric Fisher Salon has received abundant awards including Retail Salon of the Year and Salon of the Year-Special Merit, and it has won numerous national makeover and color awards. The salon has been named one of the top 200 fastest-growing salons in America and one of the top cutting salons coast to coast by Ladies Home Journal, and it was featured as one of the best training salons by Allure. Eric Fisher was a winner in the North American Hair Stylist of the Year awards, and Eric was named Most Newsworthy Male Hair Designer by both consumer and trade press-an accomplishment that resulted in two prestigious Editors Choice awards-and was chosen as one of the top educators of the century.